This week we’ll take a look at a player who just got another promotion to the big leagues, a few players struggling to adapt to new levels and finally check in on two players at the lower levels who have been justifying their hype. The future is now for Matt Barnes. The Red Sox have announced that he will take the ball tonight against the Indians in place of the injured Steven Wright. We have seen Barnes pitch at Fenway Park this season, but it was as a reliever and, to be frank, it did not go well (6.45 RA9, 5.84 FIP, -7.18 RE24). In his last stint with the big league club he made six appearances out of the bullpen before being demoted back to Pawtucket, where he continued pitching in a relief role. However, about a month ago the Sox decided to stretch him out for work as a starter, hoping to have him reestablish some sense of comfort by implementing his changeup on a more consistent basis. 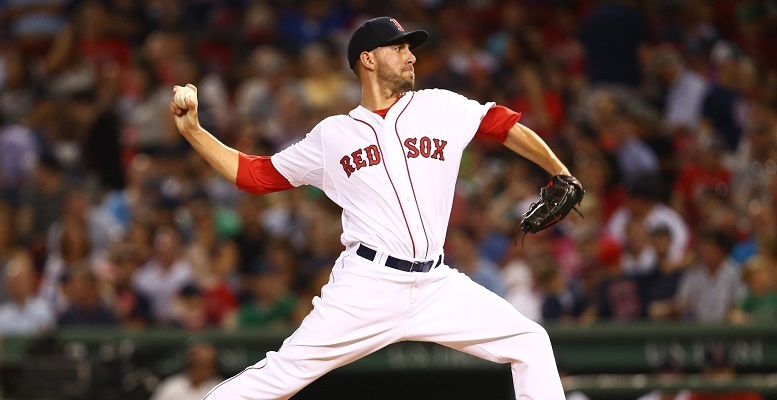 Since the decision was made Barnes has made three extended relief appearances – although performance made one of them a short outing – and two starts, and while the results have been lacking (4.41 RA9, 4.70 FIP, 12/11 K/BB), reports from Red Sox player development have been positive. The Red Sox are suggesting that they view Barnes as a starter and think he is capable of being a productive major league rotation member; something the team is desperately without. With all this in mind, it seems like a safe bet that Barnes will get an opportunity in the rotation for the Red Sox in September. Marco Hernandez was acquired by the Red Sox in the deal with the Chicago Cubs that sent Felix Doubront to the windy city last summer. He opened this year at Double-A Portland and mashed his way to a promotion in mid-July. Hernandez is not known for his bat, and his numbers at Portland were well outside of what he had shown in his time at the lower levels of the minor leagues. For example, in 2014 at High-A Daytona he slashed .270/.315/.351 with a .328 BABIP, which amounts to a .246 TAv. But in Portland he slashed .326/.349/.482 with a .382 BABIP, all good for a .287 TAv. There is no doubt that the jump in BABIP contributed to his better numbers, but he was also knocking more extra base hits (23 in 122 games at High-A, 30 in 68 games at Double-A), so there was a chance he had figured something out. Since being promoted to Triple-A his production has been more in line with his A-ball numbers, which undoubtedly represents progress given that he is now facing higher caliber pitching. But, it also provides evidence that the great offensive numbers he posted in Portland were likely anomalous. In his 101 plate appearances for Pawtucket he has slashed .258/.277/.381, his BABIP is down to .329, and he only has six extra base hits. Hernandez has had difficulty with plate discipline, having struck out in one quarter of his trips to the plate while only earning a walk three times. Hernandez has a few more weeks to continue his adjustment to the new level. His performance the rest of the way and the Red Sox’s offseason transactions (e.g., a trade involving Devon Marrero) will determine the level at which he is slotted to start the 2016 season. Carlos Asuaje is another undersized middle infielder that the Red Sox have found to provide considerable production. He has primarily played second base for the Sea Dogs this season, but has also seen time at third base. Despite his size (he is listed at 5’9”) he looks to be an offensive threat. Across Low- and High-A in 2014, he posted a .310/.395/.528 line, knocking 15 balls out of the yard and showing tremendous discipline at the plate (92/62 K/BB). This season in Portland, while he still hitting better than league average, his numbers have come down a lot from where he was at the lower levels. Some of this drop is expected given the change in level and the advanced pitching and defense that comes with it, but his reduction is considerable. One clear example is in his power numbers. This season he is only slugging .367 with a .117 isolated power. Despite this, he has maintained his advanced ability to make contact and be disciplined at the plate, as is evidenced by his 73/52 K/BB ratio. This is a really positive attribute to see in a player struggling with other aspects of his game; he is not expanding the strike zone to try and make things happen. If Asuaje can get back to hitting for some more power, that, and his defensive versatility, will help him advance toward a major league utility role. At the end of 2014, Justin Haley made six starts for Portland and pitched pretty well (1.19 RA9, 3.73 FIP). By some measures that performance has not transferred to 2015, as he has a 5.61 RA9, and 3.79 FIP. So his peripherals, as well at least one fielding independent measure, suggests that he has been basically the same guy despite the wild difference in his runs allowed average. Much of this can be explained by the fact that in 2014 he held a ridiculous 95.1 percent strand rate, a mark that has dropped to 64.7 percent this season. Relative to 2014, on a rate basis he has allowed more runners on base and more have come around to score. Some of the base runner issue is BABIP, as 2015 represents the high water mark for Haley’s opponents’ BABIP by a considerable margin, so there is some bad luck involved here. On the whole, this season has presented a challenge for Haley in that he probably feels like he is pitching in much the same way he has previously, but is not getting the same results, which has to be incredibly frustrating. His last outing was easily the best of his season results-wise (7.0 innings, one hit, no runs, no walks, six strikeouts), so hopefully he can build on it over his remaining starts. The season-to-date statistics for Ty Buttrey at High-A Salem look fairly impressive: 17 starts, 94.2 innings pitched, 4.09 RA9, 3.34 FIP. The odd thing for Buttrey this season is that he seems to consistently string together a few starts in which he only allows one run, but then has a blowup outing where he allows five or more (Eduardo Rodriguez nods sadly). On the season he has nine starts in which he has allowed fewer than two runs, but then has four starts in which he has allowed four or more runs. Taken together he has been bimodal, albeit more good than bad. He has posted a decent 2:1 strikeout-to-walk ratio and only allowed two home runs, both of which are strong signs for his future. Avoiding the periodic blowup start will be important for Buttrey’s future, but even with the rough outings considered he has probably pitched well enough to earn a promotion to Portland for next season. Through his first 34 games (162 plate appearances) Yoan Moncada was clearly struggling to adjust to his new surroundings. He had a .229/.311/.321 slashline, with only one home run and nine stolen bases in nine attempts. Over his next 30 games (122 PA) Moncada has shown why the Red Sox invested so much in him. He has posted a .333/.431/.545 slashline with five home runs and 26 stolen bases in 29 attempts. Those are extremely impressive numbers, and likely have many clamoring to rush him up through the system. But Moncada still has a lot to learn. For example he will need to demonstrate a stronger command on the strike zone. He is striking out too often (22.5 K%), as he continues to adjust to hitting breaking pitches. His defense, which could be a plus tool, is also a work in progress as he gets more consistent reps. Moncada is an exciting player who has a long way to go before reaching Boston.